Brooklyn Nine-Nine fans have accomplished a whole heck of a lot in the last month or so. Not only did our outcry over Fox’s cancellation of the beloved sitcom result in the series returning to its corporate birthplace, NBCUniversal, for a sixth season, but the couple we only recently started ’shipping might become a reality in the season-five finale. 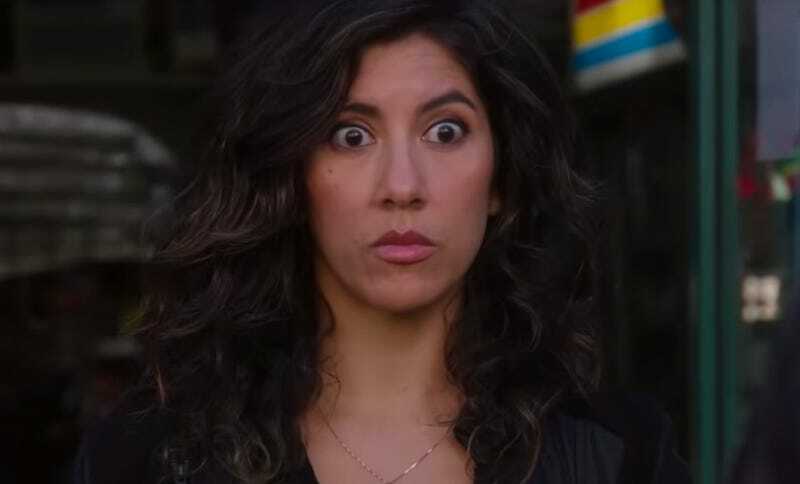 Earlier this year, Stephanie Beatriz and Gina Rodriguez “campaigned” for the Jane The Virgin star to drop by Brooklyn and maybe play Detective Rosa Diaz’s girlfriend. But no specifics about her character were given when Rodriguez was confirmed for a guest appearance back in March. Thanks to this promo for “Jake & Amy,” though, we know Rodriguez is playing a beautiful ride-share driver who clicks with Rosa. Terry (Terry Crews) isn’t about to let their meet-cute go to waste, but Rosa is her typical taciturn self about being set up—that is, until Alicia (Rodriguez) gets out of the car to help them find Amy’s veil. Then it’s time for Color Me Badd. Brooklyn Nine-Nine co-creator Dan Goor tells TV Line that Rosa isn’t looking for love, but “once she meets Gina Rodriguez’s character, will she be able to avoid it?” We think we know the answer to that question, but we’ll still tune into Fox (boo) on May 20 to be sure.